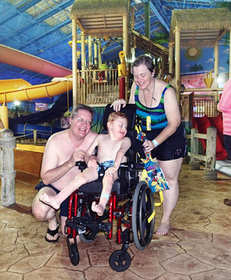 WEST BERLIN, NJ--(Marketwired - Jul 14, 2014) - Sahara Sam's Oasis, an indoor and outdoor water park in southern New Jersey, will host an exclusive special needs event, July 25. The event, Special Evenings at Sam's, or SEAS, will run from 6:00 - 9:00 p.m. and provides a judgment-free environment for special needs guests and their friends and family. The July 25 SEAS event is the third of four events hosted in 2014 but the first to include Josh the Otter, a national water safety education initiative. According to their website, Josh the Otter's mission is to, "educate children and adults worldwide about water safety through the utilization of drowning prevention campaigns & early childhood water safety training." "I really wanted to do something unique and fun for this month's SEAS event," said Annie Peters, Executive Director of the SAMBULANCE program. "Utilizing a figure like Josh the Otter helps children to have a personalized experience while learning important safety lessons." Creating a comfortable environment for special needs guests is a main focus of the SEAS events at Sahara Sam's and, Josh the Otter's initiative is just one element of the experience. Other changes are made to the water park for these exclusive events, including: modified music and lighting, limited ticket availability and, the option for guests with dietary restrictions to bring in their own food. SEAS events have been a staple of Sahara Sam's community program efforts since 2010. To date, the indoor and outdoor water park has hosted 22 SEAS events. "Educating the special needs community on water safety is a critical part of the work done at Sahara Sam's," said Peters. "And, ensuring our community is knowledgeable about water safety is the foundation for all of the efforts of our non-profit organization, the SAMBULANCE." Sahara Sam's Oasis Indoor and Outdoor Water Park of West Berlin, New Jersey was founded in March of 2009. The facility offers families of the greater Tri-State community affordable, high value entertainment the entire year with 58 of its 68-thousand square feet under a retractable roof system. Park features include arcade systems, surfing simulators, a wave pool, leisure swim areas, numerous water attractions, slides, and more. More information is available on the Sahara Sam's Press Page.